so i've posted about him briefly and if you follow me on instagram (@robynstew8), i've thrown a few pictures up on there, but i love this cute little pup so darn much that i had to give him a post all to himself! meet toby, our new sweet little yorkie. funny story about toby, he was actually my hubby's dog years ago when he was in high school and then his family gave him to his grandparents when his grandma started struggling with alzheimer's about 6-7 years ago. 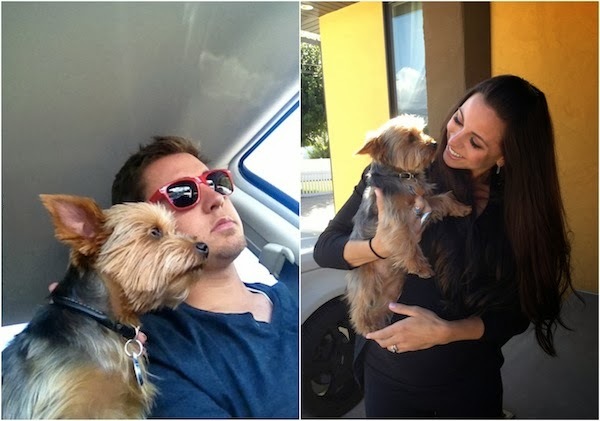 she fell in love with toby and he was such a good dog that he kept her company and stayed by her side for a long time. about a year ago nana was put in a home and after a while my hubby's grandpa realized he couldn't give the time and attention he needed to to him and thought about giving him away. well.... if you know anything about me, i am an avid pup LOVER and have been begging hubs now for 4 years for a dog (basically since the day we got married). he always said if he were to ever get a dog it would have to be toby (i think he originally said it because he knew nana would have never give him up!) because he was "the best dog ever". well his words may have come back to bite him, but ended up working in my favor when his grandpa offered him to us! looooong story short, i would have probably normally waited a while before we got a dog (being right before the baby and all) but toby just so happens to be the sweetest, low maintenance, not to mention well trained dog there is. hence, two weeks before we get our new little addition to the family, we get one more! i just know little girl will fall in love with him too and love my growing little family! just look at that face!! also, CONGRATS to danica who is the winner of the jewelmint giveaway!! email me at robynstewart4@gmail.com to claim your new beautiful jewelry! Awww I want to steal him! Yey! Beyond excited. I'm such a nerd I love seeing my name on your blog. Thanks so much! He is so so cute! Seriously SOOO happy you finally got a dog! Can't wait to meet this little dude.